Nothing says merry, merry like a little holiday treat! 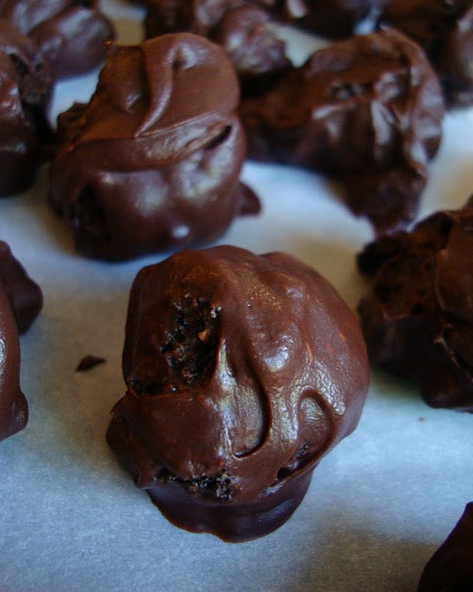 Here is a quick and easy recipe for Oreo truffles. Not too many ingredients. Addictive. Easy to pass on as a gift or surprise for a neighbor. In a food processor, or by hand in a sealable bag, crush the Oreos to a crumbly consistency. You don't want too many chunks. Stir in the cream cheese to mix it all together. The cream cheese needs to be softened for easy stirring but you don't want it too hot. Form into small balls (about the size of quarters or a little bigger) in the freezer for about 10-15 minutes while you melt the chocolate. I set mine on wax paper on baking sheets. It keeps it from falling apart while you dip. Melt the chocolate in the microwave according to package instructions or in 45 second intervals, stirring in between. Add the cream or butter if you need it. Dip away. Mine never turn out perfectly dipped but I actually like that. You can decorate with sprinkles or Oreo crumbs or whatever else you prefer! Store them in the refrigerator until ready to eat or give away!